He was nearly six feet high, but did not look his height, having in later years contracted a slight stoop. Every one has seen engravings or photographs of him. They give a very good idea of his face, for its features were well marked; and in elderly men the expression seems to become a part of the features. The form of the head, high and dome-shaped, was characteristic, and it showed all the more because nearly bare in front. A long and snow-white beard gave him a venerable aspect. The nose, which had nearly caused him to lose the voyage on the Beagle1, was rather blunt, more like that of Socrates than that of Julius Caesar. But the feature which struck one most was the projecting brow with its bushy eyebrows, and deep beneath it the large gray-blue eyes with their clear and steady look. It was an alert look, as of one accustomed to observe keenly, yet it was also calm and reflective. There was a pleasant smile which came and passed readily, but the chief impression made by the face was that of tranquil, patient thoughtfulness, as of one whose mind had long been accustomed to fix itself upon serious problems. With this there was also a benignity and serenity which reassured the visitor, and put him, however deep his reverence, at his ease in the great man's presence. One could not feel constrained or timorous, because his manner was perfectly simple and natural, with nothing to indicate any consciousness of exceptional powers. 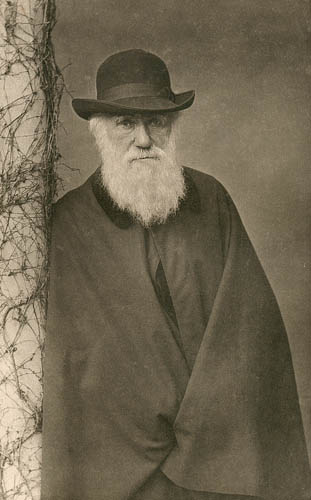 James Bryce, “Some Reminiscences of Charles Darwin”, in Harper's, Vol. 120, No. 715, December 1909, pp. 13–18, at p. 14.